ReMap is an arts initiative led by HISTORIA – we are a collective of photographic artists based in Brighton . 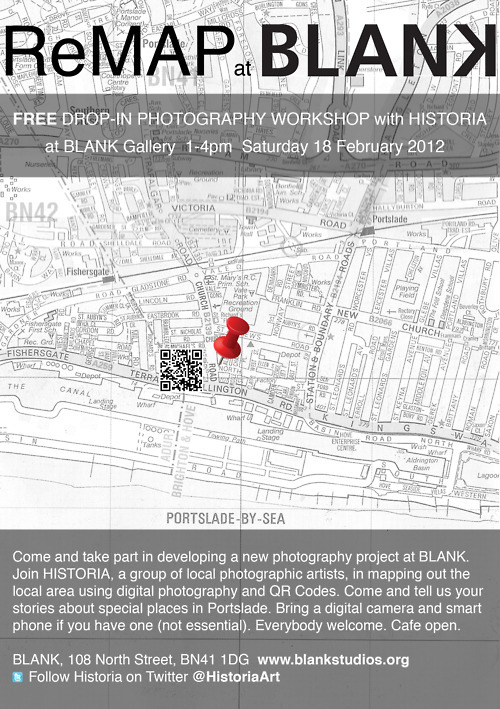 ReMap will involve an 8-week residency at BLANK Gallery in Portslade. It will include participatory workshops, a program of public events and a curated exhibition as part of the Brighton Photo Fringe in October 2012. If you are not able to donate, your support in promoting the project would also be much much appreciated. The more attention we can bring to the project the more likely we are to succeed. Please pass on the link to people you know and if you use social media please do use the Tweet and Facebook share buttons on the Sponsume page. 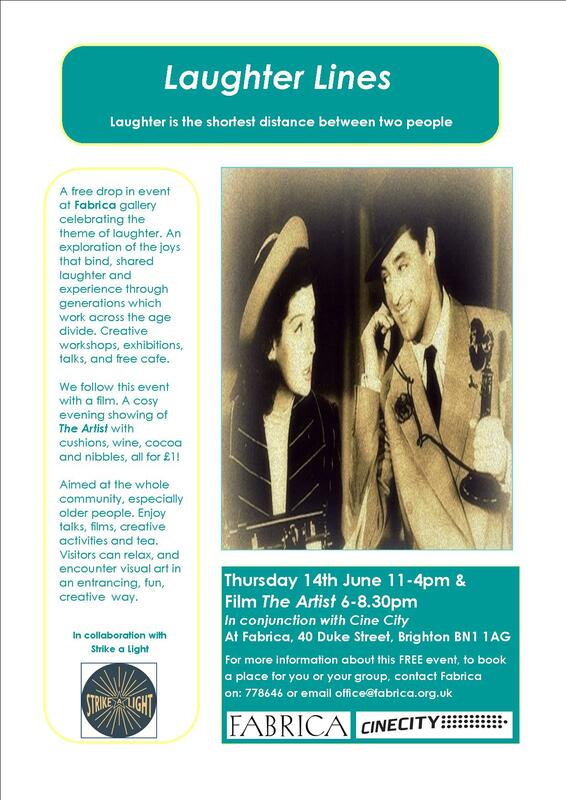 A free drop-in event at Fabrica gallery, celebrating laughter. An exploration of the joys that bind, shared laughter and experience through generations that work across the age divide. Artist Jane Fordham will be talking with people about their memories of things that have made them happy, things they find funny and what makes them laugh. An eclectic selection of objects will be used to spark memories and encourage chatter, and participants will make ‘installations’ following their experience. From 2pm, the installations will culminate into source material for the development of dance gestures led by dancer Anne Colvin, which in turn build to dancing with each other. A selection of silent comedies will be on throughout the day, which links to our evening showing of ‘The Artist’. Visitors can sit and enjoy these or casually catch them as the look around the rest of the event. Writer and artist Clare Nias will be here through the day to share her series of Flying Books, inviting participants to add to the books, which are themed on very different ideas, such as the Book of What Makes me Laugh, the Book of Mistakes and the Book of Being a Teenager. You can write, draw or collage your additions – Clare will be on hand to share stories and chat about the books. 11.30am and 3.15pm: Performer Martha Brown will be performing her piece 14 Smiles, which was inspired by an experiment, in which Martha counted how many people returned her smiles whilst walking in London. Receiving only 14 smiles, out of many more given, raised questions for her about social interaction. 14 Smiles is a funny, inquisitive and personal exploration into social interaction and the everyday. 1.15pm: Historian Sarah Tobias will be talking and singing about laughter, making people smile in theatre, music hall and song. We’ll have vintage games dotted around for people to play, sparking memories of childhood and parenthood. There will also be free hot drinks and sweet snacks for everyone to enjoy, whilst having a chat, playing a game or enjoying one of the activities. If you need help with transport we can offer it for free! Contact Clare on clare.hankinson@fabrica.org.uk or call 01273 778646 to arrange or for more details. On Sunday 17 June, Nicola Benge will taking part in the fifty four mile BHF London to Brighton cycle ride on behalf of Queenspark Books. Please sponsors her to support local heritage organisation, Queenspark Books. Last year she walked a 106 miles along the entire South Downs Way from Winchester Cathedral in Hampshire to Eastbourne in East Sussex and raised a whopping £450! Thank you to everyone who sponsored her. Every penny helps but no contribution is too small! 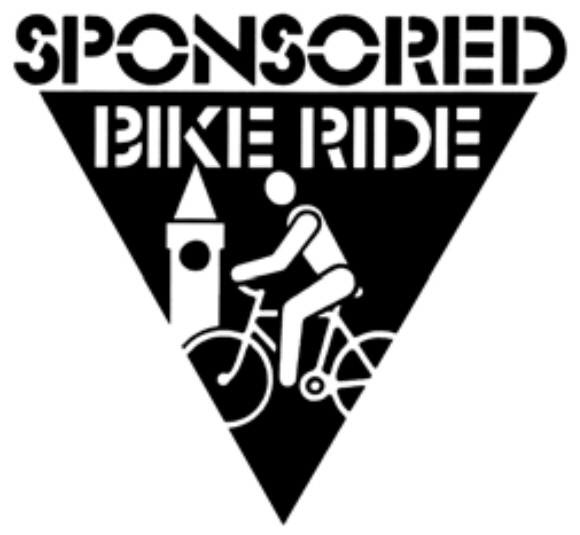 This year with your help, she is hoping to top this fantastic contribution to QueenSpark funds by taking part in the fifty four mile London to Brighton cycle ride. … and please pass this on to your friends. See you at the finish line….